Klosterneuburg is a city just north of Vienna, and wasn′t it for the Leopoldsberg Mountain that segregates the two communities, they would have merged a long time ago. Situated by the Danube and near the Vienna Woods, with vineyards creeping up the hills, Klosterneuburg is quite a pretty place and hugely popular with tourists (and rich Viennese commuters that live there) who want to go there for an easy daytrip. Trains from Vienna′s northern stations leave once every couple of minutes and the train ride takes less than ten minutes - Klosterneuburg is literally once around the hill. There are several reasons why Klosterneuburg is so popular with tourists. The main one is the Augustine Chorister′s monastery of Klosterneuburg. When the Habsburgs split into a German and a Spanish line (see "History of Austria"), the German one tried to model the monastery after the Escorial near Madrid in the 18th century. They lost interest in the project, though, and so only one of originally four planned courtyards was finished. In the 19th century, the façade of the church got its current neo-Gothic look, and so the entire thing is a bizarre mix of Baroque, Gothic and neo-Gothic styles, based on a Romanesque foundation. Apart from the building, Klosterneuburg is famous for its extensive art collection, for which it pays back to take a guided tour. Now, since I have talked about the monastery in the separate article on the monasteries of Lower Austria and Vienna, I will now concentrate on the non-monastic attractions of Klosterneuburg. Firstly, there is the general appearance of the city with the obligatory main square, the Baroque Rathaus City Hall and - typically Eastern Austrian - plenty of Heurige wine bars. Despite of the extreme vicinity to Vienna, the Heurigen of Klosterneuburg are already a lot more authentic than their counterparts in Grinzing or Nussdorf, the capital′s most popular Heurigen districts. They are cheaper, too, and so I recommend stopping by for a glass of wine and a snack especially on a warm midsummer evening. 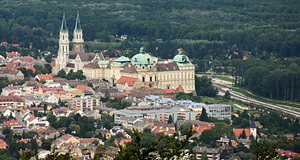 Klosterneuburg is the patron city of the Sudetendeutsche, the German minority of Bohemia that was expelled in pogroms after WWII. Many Sudentendeutsche had benefited from or were even actively involved with Nazi actions, and since they were also a rather wealthy bunch, they instantly and altogether (meaning: including vast numbers of civilians) turned into victims once the Nazis had been defeated. Some 3.5 million people had to leave their homes under quite brutal conditions and their progeny now live mostly in Austria and southern Germany. There is a small park in Klosterneuburg that commemorates these events. Continue with "Klosterneuburg - Part II"